is coming to an end! While teaching throughout the country I get to see all types of scrappers. Some who save 'every' scrap piece of paper, some who save just the frames, and some who only save the extra pieces if they are a certain size. No matter what type of 'saver' you are, this prize is for 'you'!!! PRIZE - one comment will be chosen at random and they will receive the large box of scraps pictured here from STACY's desk (QQ owner & designer). Stacy designs all of the Club Q items AND the monthly kits that are available in your local scrapbook stores. She is one amazingly talented & busy lady. You can bet there are 'amazing' gems inside this box to be won!!! (PS - her husband, Andy, told me there are a few 'almost' complete class kits in there too - woohoo!) ***See prize disclaimer at the bottom of this post. Check back on Mon (8/22) when the winner will be announced! I love Grab Bags and surprises and this would be an ultimate Grab Bag!!!! I would love to win this because I love paper crafting, duuuhhh! I love supplies! Plus, I'm on a scrap budget and this would be an awesome prize to win! Who wouldn't want to win a "scrap stash"?? Any addition to my own collection would be very welcome! Hey - it would be like Christmas in August!....mmmmm could I scrap that? I love surprises and I love scrapbook supplies, so would love to win this prize! I would love to win. I think scraps can bring some great ideas. Looking at ribbon, paper or a quote could help to make a great page. Esp if you have a block. oh my goodness i can't imagine what fabulous items there are in there! What an amazing prize! I make mini albums to show off pictures of my grandchildren to EVERYBODY at work. The scraps would come in very handy, because that is what I use now. I have made these little books for family members too. I love quick quotes. This would be incredible to win!!!! I would be honored to have Stacy's scraps that she personally designed for the kits! I would also hope that by having her scraps her creative mojo would rub off and inspire me! Scraps are often and sometimes a great source of inspiration! I save everything and usually picture all kinds of ideas of things I could do even with the smallest scraps. It would be fun and interesting to see what you could do with someone else's scraps! What a fun prize this would be to win! I keep just about all my scraps, but I actually use them too, so this would be awesome!! I am a huge scrap saver! I love making my cards out of odds and ends! I think it is awesome that you are giving this away!! Stacy's kits are scraptabulous! I cannot wait each month until my Club Q kits arrive!. I love grab bags and have a special spot (actually several) in my scraproom just for QQ product! Thanks! 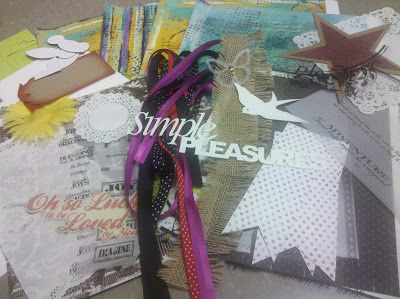 Scraps come in so handy for anything from cards to layouts! And it's always exciting to get a grab bag of scraps. I would love to win this scrap box. I used to throw my scraps away if they weren't a certain size, but here lately I save everything. For instance, I recently bought a border punch, and after using it, I saved the little cut outs. I intend to use them as flower petals. Because a girl can never have too many scraps! I want to win one of your box full of scraps because you have the most beautiful ribbon, paper, and vellum quotes around! What an awesome giveaway! One girls scraps, is another girls treasure. I would love to win this prize, I use my scraps for smaller projects.. Thanks for the chance. I LOVE scraps! Just posted cards I made on my blog all made from scraps! Been a follower for quite a while! I LOVE scraps... in fact most of my cards are made using my scraps in some way or another! I hate to be wasteful so I keep almost ever left over little piece of paper from other projects just in case... and if it isn't big enough to really use I use them as testers for stamps or things I need to try things out on! Oh, the places these scraps and I would go... Thanks so much for the chance! I am fairly new to scraping and I have taken all my friends hand me down scraps. I luv using scraps they are wonderful to use on my projects. You can never have to many scraps. You mean there are some people who DON'T save scraps??? I can't imagine! I'm one of the ones who saves almost all scraps, especially of papers that I really love or are specialty types like the foils and glitters, and I actually use even the small pieces all the time. I would LOVE to win Stacy's scraps because it would give me a chance to use some of the gorgeous materials that I can't otherwise afford. I have no doubt that I could make some beautiful cards and other projects with Stacy's discards. I save all my scraps. I have my paper sorted by color and put the scrap with the color. I would love to win this box of scraps to share with my friends. We are a group of long time friends that like to get together every couple of weeks and share our journey in life and while we are chatting we like to create cards,scrapbook pages,and some of us stitch. We have such a loving & supportive group and have been friends for about 15 years. 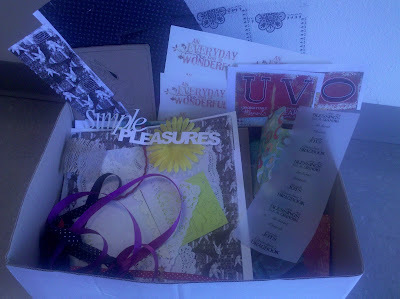 i so enjoyed the workshop at st charles expo yesterday and would love the box of scraps to play with!!!! I love all the quick quotes stuff. I just got home from CKC Tulsa and loved all the QQ stuff I saw at convention! Last day of convention. Sorry! Great job Lisa. Looking forward to next year! I am a scrap hoader. This would be awesome. When you are dealing with Quick Quotes there is no such thing as scraps....I hope I win! Sounds like this box is more than just scraps! But I love finding that perfect little piece to fit a layout or card...without cutting up a 12 x 12 piece of paper! Who wouldn't want a box of "scraps"? By the look of the picture, they aren't scraps anyway! Lisa, I would LOVE, LOVE, LOVE to win Stacy's box of scraps! I took your classes this weekend in Tulsa and can only imagine how wonderful it would be to get my hands on that girl's scraps!! I save all my scraps - one tub for solids, the other for patterns. Can always use more! I would love Stacy's scraps!! I keep everything!! I took several classes at CKC Tulsa and the majority of them were QQ classes. I love your paper and would put the scraps to good use. All I have to say is, "One Crafters scraps are another Scrappers treasures. Would love to win. I love qq products and would even take scraps! I have drawers in my organization stuff that is specifically designed for scraps. I use the all the time since I am an avid paperpiecer. QuickQuote scraps are not really scraps, lol. They would be used on cards and layouts. thanks for chance to win. SCRAPS... A terrible thing to waste!!! I would love to go thru her scraps, I mean it is QQ products. I save it all, look at my room! I use every scrap and corner of paper that I can get away with. I am the queen of making things last and not waste good product (such as yours!). Would love to see what you have for scraps! It is fun going through someone elses scraps. Woo hoo!! I love leftovers, especially if it is scraps for scrapbooking!! I bet there is so many goodies in that box!! I am drooling allover my shelf just thinking about it!!! Thanks for this chance to win such an awesome box of leftovers!! I love scraps! I have made some of my best pages and cards with bits and pieces of left overs. If there is one thing that I have learned at the QQ classes that I have taken and the Private Reseve that I have been too, QQ is awesome about making sure you use all your paper. I love using scraps. You get this great feeling when you use scraps from an old project. Would love to win. I love scraps, especially someone elses. They always have better scraps than I do. I would love to have the box of scraps to use in my special education classroom. Many of my students do not even have crayons and this gift would allow them to create some beautiful gifts for their families. I don't see scraps, I see lots of stuff for cards and smaller page layouts. LOVE scraps! I save it all. How fun to have new ones to dive into. I save scraps, etc. too. It is a lot more fun to play with someone elses scraps!! !